Upon arrival in Sri Lanka, one of the first things you will notice as you step outside the airport is the heat - something you do get used to! You will be met at the airport and be driven directly to your host family where you can freshen up and rest. A Projects Abroad staff member will then come to meet you that evening or the next morning and take you out for a meal. You will be given a welcome pack and will have the chance to discuss anything you wish to know more about. Please note that if you arrive in Sri Lanka on a Friday, you will receive your orientation the following Monday. If you arrive on Friday morning, you can choose to have your orientation that afternoon. Over the weekend, our local staff will keep in contact with you and they will be able to include you in some social activities. This also applies to volunteers who arrive in Sri Lanka on a Saturday. The majority of our volunteers are based within a couple of hour’s drive of Colombo, in several small coastal towns, from Negombo to Kalutara. All our volunteers live with local host families who are always eager to teach the volunteers Sinhala and practice their English. All your meals will be cooked by your Sri Lankan hosts, so you’ll be able to taste the delicious, authentic cuisine! 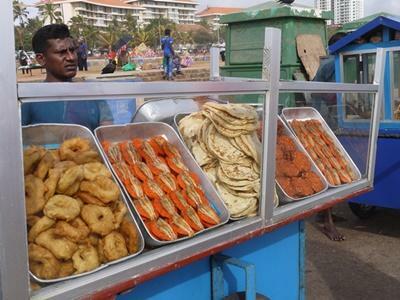 Sri Lankan food is similar to South Indian dishes with lots of rice and hot curries. Fresh fruit is widely available as well as fresh fish and seafood. Vegetarians can be easily accommodated. Once you have gotten settled in at your host family, a member of staff will give you a general orientation of the area so you can get your bearings. Later that day or the next morning you’ll be taken to meet your placement supervisor where you will be volunteering. A Projects Abroad staff member will then stay with you until you are settled at work and happy with your schedule. Most volunteers walk to work. However some volunteers have to take the bus. If you need to use public transportation to get to work we will show you the route and help you become familiar with the landmarks. If you are volunteering on a Standard Project, all necessary work-related transportation costs will be covered by Projects Abroad. With Sri Lanka being a relatively small country, it is easy to get around. There are frequent buses in and out of Colombo along the main costal road and also into the hill region. Here you will be able to find anything you need to buy and any type of food you wish to eat! Internet is also readily available and is the cheapest and easiest way of staying in touch with friends and family back home. At the end of your project we will arrange a taxi to take you back to the airport to catch your flight home.